Sandy and I can be incredibly lazy most of the time, but this past weekend we both got a lot done. A lot of grocery shopping and house cleaning. I spent most of Sunday in the studio at the Church of the Covenant. Turning on the air conditioner on Friday night was the key to having it comfortable all weekend. 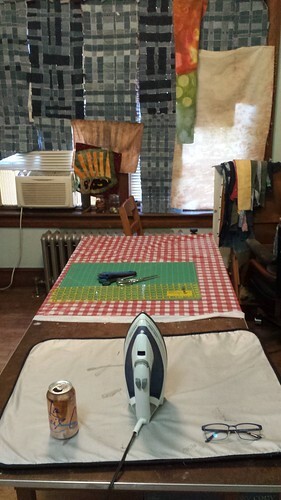 I sewed another large denim panel, then concentrated on cleaning and organizing the studio. I had a huge pile of fabric scraps and old shirts on the table. By the end of Sunday I had ironed them all and sorted them into different bins. I rolled the fabric pieces so that they wouldn’t get wrinkled again. 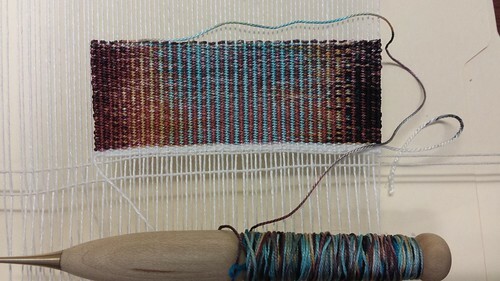 Also working on this sweet little woven piece with the dyed silk weft I painted when I was at Pam Patrie’s workshop in May. I had to fiddle with it to get the right width, but it’s working! 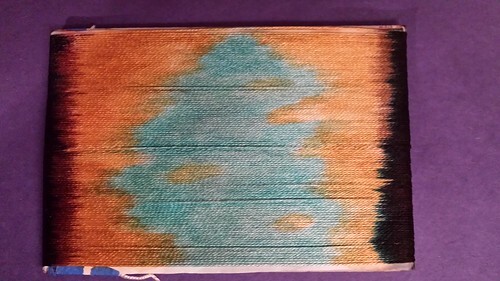 I think that the key was to make the width shorter so that I have room to put the weft where I want it on the front, make the back side of the card a contrasting color, and paint the edges so that you can see where the sides should be. 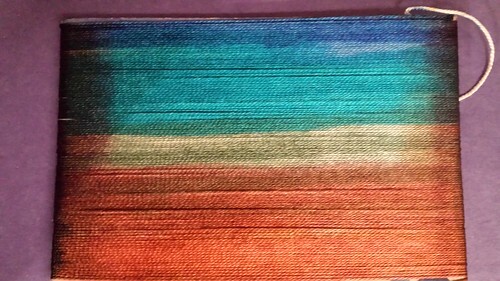 Also, really saturate the weft with the dye. The second and third photos are of the card I painted it on. It’s kind of mindless fun, and easy to haul around for a project for the road. It will be interesting to see how it looks when I get to the blue area on the back. Thanks! It’s fun watching it grow, not being certain of the outcome.